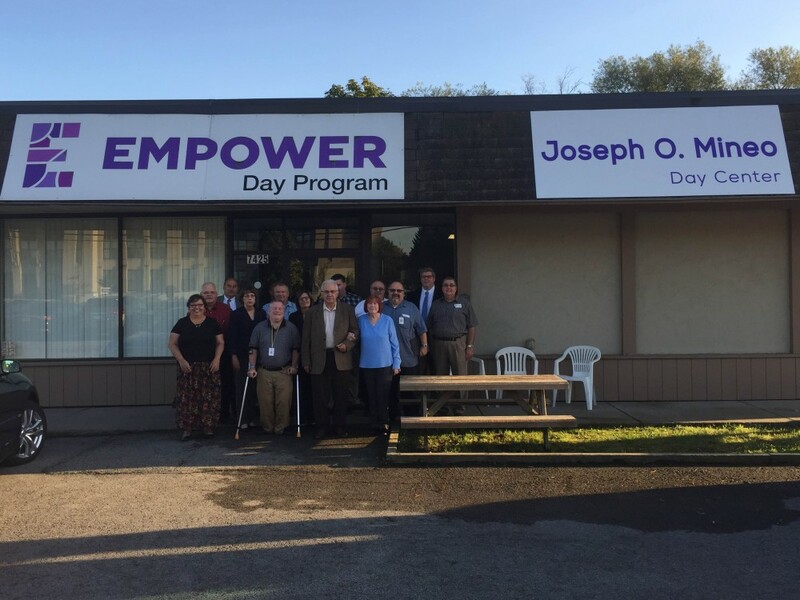 TOWN OF NIAGARA, N.Y., October 4, 2017 – Empower, the not-for-profit organization formerly known as Niagara Cerebral Palsy, honored former Chief Executive Officer Joseph O. Mineo by renaming its Day Habilitation building as the Joseph O. Mineo Day Center. Mineo worked at Empower for 47 years, 45 of which were as the agency’s chief executive officer. Under his leadership, Empower established most of the programs and services that exist today. The Joseph O. Mineo Day Center is where people with intellectual or developmental disabilities can participate in daytime recreation activities and socialize with others. It is located at 7425 Buffalo Ave. in the City of Niagara Falls. On Wednesday, October 3, Empower staff, board members, New York State Assemblymember Angelo Morinello and members of Mr. Mineo’s family gathered to honor him and to celebrate the new name. “Our five service divisions, our administrative functions, the physical locations where we provide services – these are all part of Joe’s legacy,” said current Empower Chief Executive Officer Jeff Paterson. “Thousands and thousands of lives have been transformed, and countless people have been able to imagine a different and better life for themselves, because of Joe’s work.”. With 300 employees and a $14 million budget, Empower is one of Western New York’s 60 largest nonprofit organizations. The administrative offices, preschool, community clinic and service coordination program are located on Lockport Road in the Town of Niagara. The job training and day programs division is based in Niagara Falls, while residential facilities are located throughout Niagara County. Licensed by the New York State Office for People with Developmental Disabilities and the New York State Education Department, Empower is an affiliate of the Cerebral Palsy Associations of New York State. This entry was posted in Our News on October 5, 2017 by Elizabeth Cardamone.